Make money online with risk free betting ... an honest review! Make money online with risk free betting … an honest review! However you want to think of money you can’t deny that it pretty much makes the world go around…. without it things would be sooo much easier (or would it!?) who knows its never going to happen so if someone said to you right now would you like to start earning some tax free profits from just playing with a few numbers, what would you say? 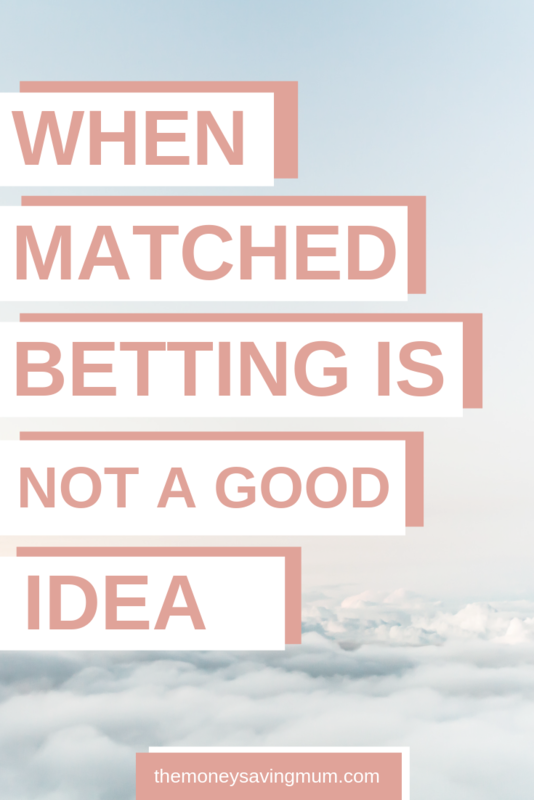 Very briefly if you haven’t heard of matched betting before it is where you back something to win with a bookmaker and then also back it to not win (known in matched betting as a lay) with another bookie/broker meaning you lose nothing because one of the other is going to ‘win’. But how is that free money I hear you ask? Well by placing this initial bet with bookie who is offering you a £60 free bet in exchange for £10 of your money (like the example below), that you are now going to make a profit from. Using that free bet to place your next bet will guarantee you a profit because where before we were laying against it to win, we will now be either under or laying it using a matched betting calculator. You don’t even have to think about the figures if numbers are not really your forte just let the calulator do everything for you! You are sometimes going to lose a very small amount in exchange for a free bet or other form of bonus/offer but this is quite normal and is just deducted from your free bet profit. There are people out there making £1000s on MBing… truly £1000s a month. Ok so I’ve never actually seen their bank balances but there are a lot of people out there saying the same thing on a website I’m a member of and I’ve no real reason to doubt them to be fair… I can see how it’s totally achievable if 1)you have the money to begin with AND 2) the time to invest. Now the difference between me and these £1000/month folk is that I’m not an avid or consistently matched bet-er – I just don’t have the time… the more time you have to put in I can see can earn you £1000s/month HOWEVER for me personally I use it as and when I can for whatever offers on at the time and when I have the time to complete it. That being said I have made just short of £1000 in about 5/6 months which I know is excellent and has helped us greatly in the last few months for childcare but it’s such a small amount in comparison to what you COULD earn. Matched betting is not the easiest thing to understand. you WILL need some money to start with… the more you have to start with the more profits you can earn however if you have only got a small amount don’t feel disheartened just either concentrate on getting as much as you possibly can for your money with what you have got or wait until you can afford to have a min of £100 to float around between bookies. don’t get drawn into expecting to earn £1000 guaranteed every month… those amounts are NOT guaranteed there is still an element of luck to a lot of the offers you will end up doing once you have progressed to the ‘advanced’ section of Profit Accumulator but ultimately don’t get too attached and obsessed with trying to make those amounts of money. Although its ‘advertised’ as risk free you do sometimes lose money… mistakes are made and WILL be made particularly when you are learning (& even when you think you are 100% up to speed!). As I’ve already mentioned in order to qualify for some offers too expect to ‘lose’ a couple of £’s per offer – this is ok and acceptable as you should deduct it from the profit you will be getting from the offer/free bet ultimately leaving you with NO losses. AND last but my no means least the most important point of them all… if you find it easy to become addicted to something or feel you might struggle to walk away when you’re up and pop £10 here on the slots and £10 here on another in the space of 10 minutes then don’t even consider getting involved with matched betting. It is very easy to get drawn into offers that you get NOTHING out of .. ones that pop up when you’ve placed a bet. If you think you’d be tempted or you notice you are tempted by them once you start and you can’t stop then walk away. Matched betting is still betting in the eyes of the bookmakers – only YOU know you are matched betting. Although it’s not illegal, it is frowned upon and if the bookies suspect you are doing it and guaranteeing a profit on every bet then they can ban you (this is called being ‘gubbed’). So make sure you remember from the bookies point of view you are a regular punter and make it look like that as long as you are placing bets. In order to make it look like you are a regular punter and your account with the bookies is a normal account don’t just bet on things that guarantee free bet, offers or bonus’… they will automatically think all you are after is the freebies (granted you are!) so be prepared to bet on regular occasions on things that you get nothing in exchange for (this is called mugging). You will not lose massive amounts, it will probably be pence maybe a £1 but it will keep your account with the bookies active for longer and will stop them restricting you. As I mentioned previously i don’t earn half as much as some people who matched betting but I also like that although its a small amount of money I have less chance of getting gubbed because I don’t do EVERY single offer available, I don’t do the maximum stakes that are available because I don’t have the money in the first place so I probably do look very much like a regular punter. A lot of these people who do earn £1000s+ per month I have noticed are gubbed from many of the big bookmakers so although they can still place bets with them they will either have stake restrictions OR are banned from taking them up on any offers. Now I’m not going to go into too much about how, what, when and where because there is a fairly comprehensive website available to explain EVERYTHING to you called Profit Accumulator – I feel I will probably just confuse you even more than you are now so if you haven’t already popped over to Profit Accumulator head over there now and have a watch of their fab tutorial videos on the whole process. Profit Accumulator does cost per month but you can do a free trial to see how you get on with the tutorials before you commit to them. Let me know if you end up having a go at matched betting – just give it a try and see if it’s for you and ask if you need any help! etpmetWhether you use it like me as and when you can for a little extra money (mine paid for my childcare this month so has made me a little more determined this month to try and recoup that back!) or you may just want to go all out and earn as much as you possibly can.. whatever your situation be careful.. don’t get drawn in and again if you are even slightly tempted to pop a regular £10 bet on here or there.. step away before you do! Hope this helps & feel free to pin to read again later!